In our online world, the finish line keeps moving and the industry needs to be a bit more ready, writes interim editor Megan Haynes. I’m going to let you in on a little secret: I’m obsessed with Riverdale, the Vancouver-shot soapy teen drama Netflix co created with the CW. The Twin Peaks-esque reinvention of the famous Archie comics is so over-the-top and campy, the dialogue is a bit stilted and, while I love some of the positive messaging it tries to sell, the deeper meaning can feel a bit forced. The actors are all ridiculously good looking (where are the pimples!) and the love triangles are turning into love squares and polygons. It’s Pretty Little Liars (which I also loved) and Gossip Girl rolled into one beautifully shot melodrama. We may be in the “golden era” of television, but there’s nothing lustrous about Riverdale (other than its pretty shiny stars). It’s not going to change how we view content. It’s popcorn, for the brain. And I tune in each week for a treat. The business has changed, but what’s old is new again. It’s been nearly two decades since Napster came onto the scene and upended the music model. That piracy bled slowly into the film and TV space and broadcasters and producers have scrambled to catch up ever since. Except, of course, the finish line keeps moving on everyone. Riverdale and Netflix are a perfect example. Netflix’s SVOD business is 10 years old. It has to have everything figured out by now, right? License content people want to see, put it online, watch the bingeing begin. But then other SVODs got into to the game, and simply licensing existing libraries wasn’t enough anymore. So, it had to create its own originals. Enter House of Cards, Orange is the New Black and Stranger Things: Put the shows online all at once, and watch the audiences fall in love. But then it committed to 1,000 hours of original content in 2017 (up from 600 in 2016). And suddenly, there’s more pressure to move content through the pipelines quickly. In traditional broadcast fashion, Netflix started tapping co-productions – like Riverdale or Anne, in partnership with CBC, which necessitated a change to its ardent approach to dropping content in a single block. So media world take note: Netflix doesn’t even have it all figured out. You are not alone. At our digital roundtable, CBC’s Richard Kanee said it best: The industry is no longer throwing ideas at a wall to see what sticks – it has a good idea of what audiences want. But give it five years, and everything is going to shift again. Bring on the VR and other formats we haven’t even heard of yet! Sure, creating content for an online world necessitates some evolution. But take solace in the fact that people still crave bad reality series. They still love cop procedurals. And we still obsess over soapy teen dramas. They want The Real Housewives and The Amazing Gayl Pile – as well as House of Cards and Game of Thrones. People will still tune in weekly to watch their new obsession. They’ll still go to the theatres for much hyped films, and then re-watch them online when they become available. Many of the same life lessons from linear apply to digital television: Proofs of concept are an effective way of getting your TV series greenlit – it just might be a web series instead of a pilot; co-productions are still the lifeblood of Canadian television; own the IP and you can go far, my friend. So you don’t have to throw out everything you’ve learned along the way to make it big (or at all) online. And while broadcasters may have once feared the SVOD model, it seems like today Netflix is their new BFF. In the wake of its shomi shuttering (seriously, RIP shomi), Rogers announced new customers would get a two year membership to Netflix. Discovery’s Frontier and CBC’s Anne both received a top-up on budgets, which not only benefits the producers, but raises the production quality to levels a single-player broadcaster couldn’t have achieved (with much fewer notes than a traditional copro situation). 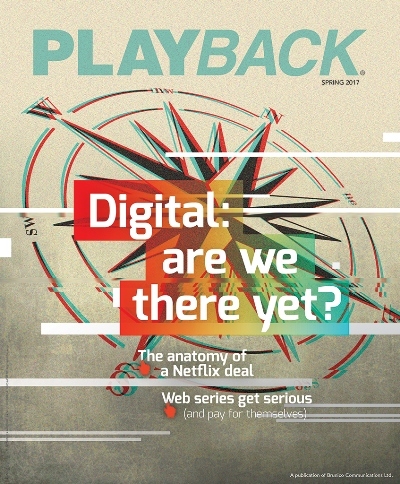 On the cover, we asked “Digital: Are we there yet?” I’m sorry to say, we’ll never be there. The compass is just going to keep changing directions. But some smart business strategies will help everyone keep their equilibrium. Links to content will be posted here as they are added to the site. Re-examining the reboot: Humankind is being willingly overrun by a reboot pandemic. But why do we love a good remake and is it smart for business? Read more here. Inside eOne’s Goon 2 promo push: The distributor hopes its social strategy and physical footprint will help draw new and established audiences to the sequel. Read more here. Breaking down the 2017 CSAs. Trends in this year’s Canadian Screen Award nominees. Read more here. 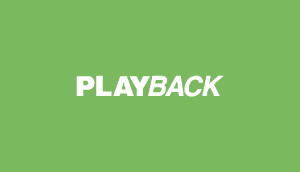 Programming profile: CraveTV: Playback catches up with Mike Cosentino and Tracey Pearce at Bell Media to find out how the largest Canadian-owned SVOD is differentiating itself from the pack. Read more here. The anatomy of a Netflix deal: It seems everyone wants to sign with the SVOD. But how to do it? And what does it mean? We break down how people are scoring deals with the platform. Read more here. 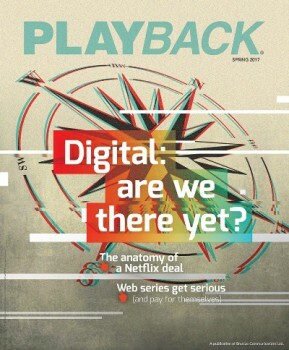 Playback‘s Digital Roundtable: Execs from leading media companies dig into everything from discoverability to monetization and working with SVODS. Read part one here. Read part two here. Web series grow up, part 1: How LaRue Entertainment built an audience for its oddball comedy The Amazing Gayl Pile before bringing NBCUniversal and CBC into the mix. Web series grow up, part 2: A deal with Syfy took Secret Location’s Halcyon to 80 territories globally, garnering acclaim for its novel format. Now, it’s been optioned for an hour-long TV version. 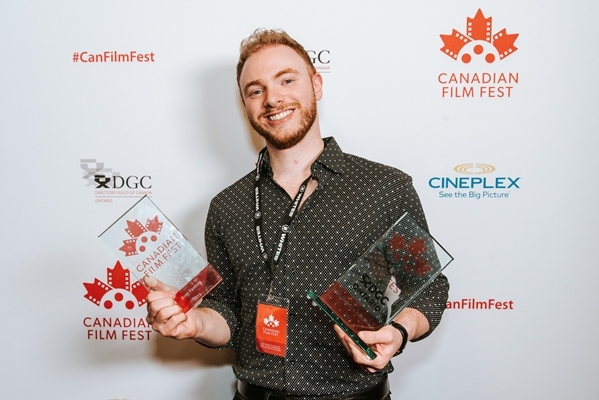 Web series grow up, part 3: With a second season in the pipeline, a TV version in development with CBC and a mobile app on the way, First Love Films is building multiple worlds around its web series, Riftworld Chronicles. Telefilm: The lifeblood of Canadian cinema: As the movie funder reflects on 50 years, stakeholders weigh in on where the organization needs to go in an industry that’s increasingly global, digital and diverse. Read more here. Playback’s 2017 Hall of Fame: Ann Medina - The broadcast journalist turned Academy of Canadian Cinema and Television chair worked to raise the profile of local TV. Read more here.